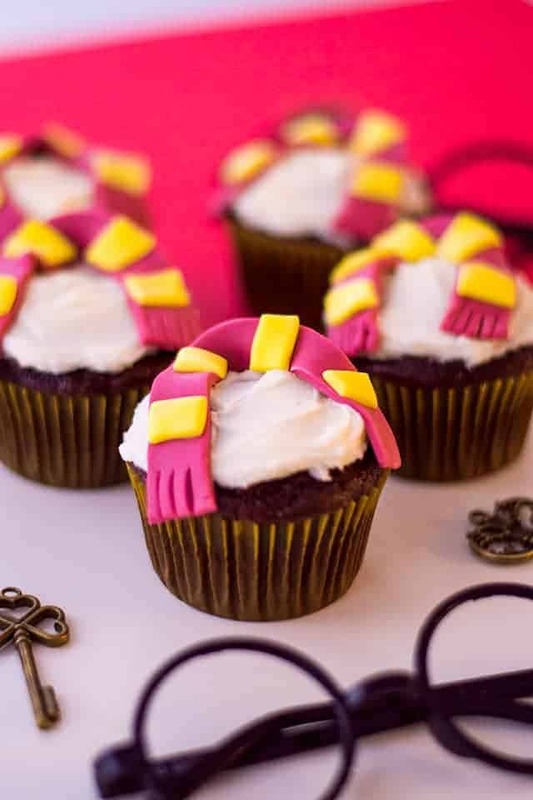 These easy Harry Potter cupcakes sport a fondant Gryffindor scarf as cupcake toppers. The cupcake is made from a chocolate cake mix and topped with homemade vanilla frosting. 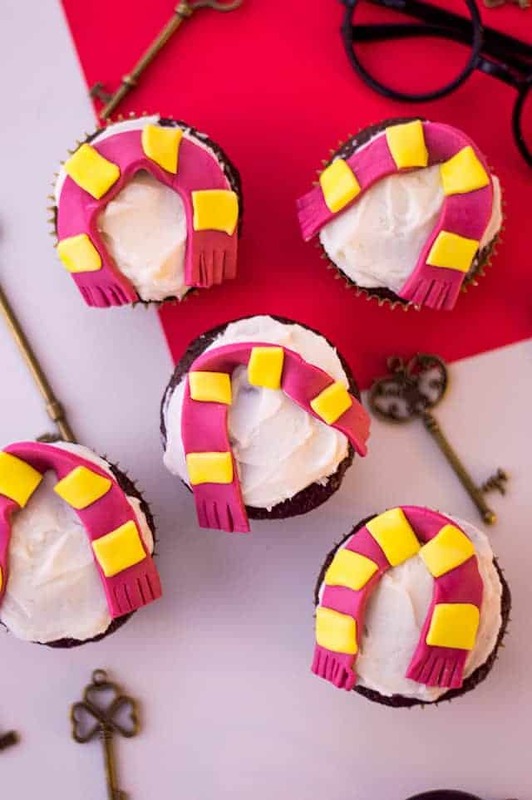 Either way, these cute Harry Potter Cupcakes topped with fondant Gryffindor scarves were made for Lucian after we went and watched Fantastic Beasts: The Crimes of Grindelwald in the theaters for my birthday. I won’t give any spoilers, but the movie was just as amazing as the rest of them. I left the theater questioning everything. 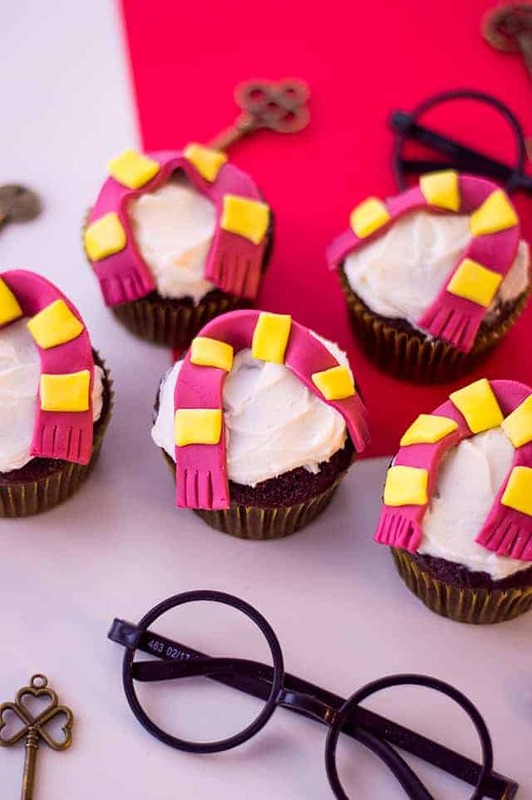 There are so many things you can create as Harry Potter cupcake toppers! You could do a Gryffindor scarf, the golden snitch, a lightning bolt, Harry Potter’s wand, etc. I went with the scarf, but you already know that. I do have a Harry Potter’s Butterbeer Cupcake recipe that is topped with a lightning bolt. Start by grabbing some white fondant and dividing it in half. 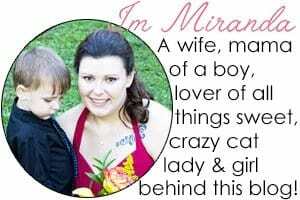 You’ll need burgundy gel food coloring and yellow gel food coloring. Color one piece of the fondant with the burgundy and the other with the yellow. You’ll want to have deep colors to be generous with the gel food coloring. Knead the color in until there are no more streaks of color. It should all be one solid color. 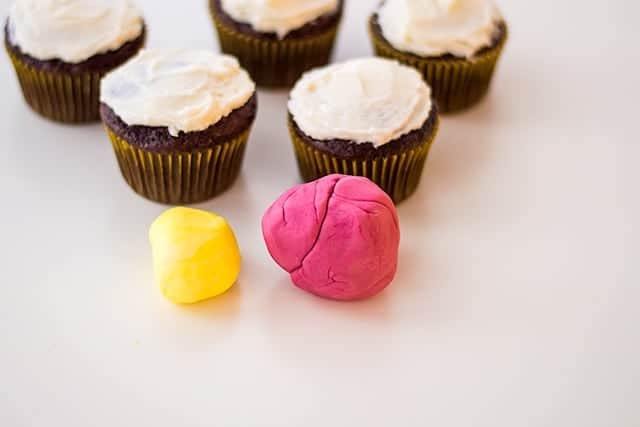 Dust your work surface with cornstarch before rolling out the colored fondant. The fondant can become quite sticky when adding in your own gel paste food color. Add cornstarch to a rolling pin as well. Roll both fondant colors separately until they are about a quarter of an inch thick. 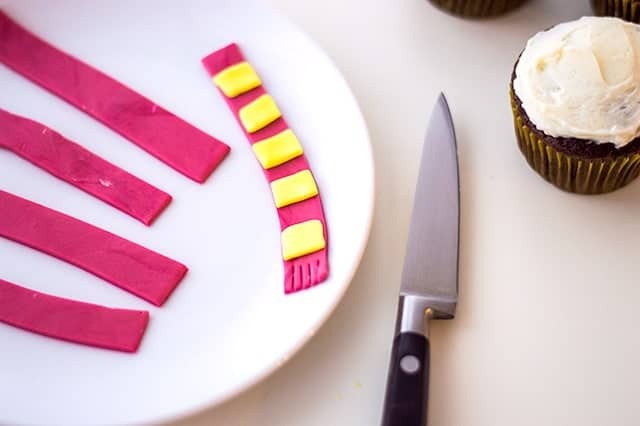 After the fondant is rolled out, cut the burgundy fondant into strips and cut the yellow fondant into small rectangular pieces. Dab some water on the back of each yellow piece and place on the burgundy strip. That’s it! Wait, I almost forgot. 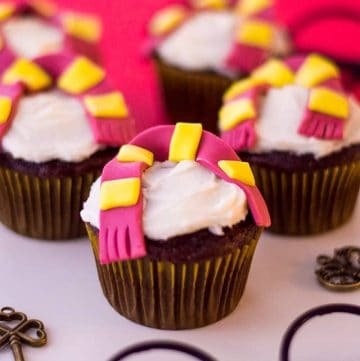 You’ll need to cut some tassels on the end of each fondant scarf. If you have tiny fingers or more patience than I do, you could twist each little tassel to make it look more realistic. Fill the cupcake liners 1/2 full with the cake batter. In a large mixing bowl, add butter, powdered sugar, vanilla extract, and milk. Beat on medium until light and fluffy. Using an offset spatula, frost each cooled cupcake. Take 8 oz. of your white fondant and color with burgundy gel food coloring. Knead until completely tinted. Color the remainder of your white fondant with the yellow food gel food coloring. Knead until completely tinted. Sprinkle your work surface with cornstarch. Add cornstarch to a rolling pin as well. Roll both fondant colors separately until they are about a quarter of an inch thick. Cut the burgundy fondant into strips, about 4 inches long and half an inch in width. Cut the yellow fondant into small rectangular pieces. You will need about 72 of them or 4 rectangles per a scarf. Dab some water on the back of each yellow piece and place on the burgundy strip, spaced apart. You should be able to add about 4 pieces. Cut some tassels on the end of each fondant scarf and place one on top of each cupcake.